Icon brands are defined as distinctive identifiers which transcend their products or services to become part of the popular culture. The iconic personality representing the cultural intermediary contains strong cultural values that can be deeply rooted in the receiver’s mind. The 1980s was a particular period where foreign culture experienced immense growth in popularity and acceptance in Asia. Dr. Serina Ha examines the importance of these agents by 4Ds: Discovery; Decision; Direction and Diffusion of Culture. Dr. Ha interviewed the agents of the cultural intermediaries, which includes editors of magazines, producers, front stage performers and cultural instructors in Shanghai and Hong Kong to examine their contribution to its corresponding culture and education as well as their localization impact to society. Dr. Ha is also an accomplished Pressed Flower Artist and L’ecrin Flower Artist Instructor of the Japan Fushigina Pressed Flower Association. She received Prize Award honor at the 9th World Pressed Flower Craft Exhibition Goyang Korea in 2015; Honorable Mention Award at the Philadelphia Flower Show and the Best Art Award in Japan L’ecrin Flower Competition in 2017. 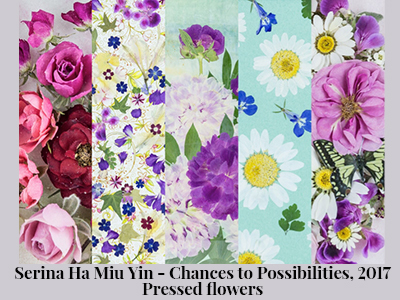 She will share her path as an iconic cultural intermediary for introducing pressed flower art and conduct a workshop to the participants of making pressed flower bookmarkers. Dr. Serina Ha Miu Yin holds a PhD from School of Modern Languages and Cultures at the University of Hong Kong. She graduated with a MA in communication and MSoc in Media Management from Hong Kong Baptist University. Dr. Ha is also a member and panel convenor of International Union of Anthropological and Ethological Science and a guest lecturer of University of Hong Kong; Hong Kong Baptist University; Japan Society of Hong Kong, Hong Kong Institute of Education, among others. Dr. Ha is also an expert in Media and Creative industry and has won 11 international awards in the past years at Beijing People Broadcasting “Win by Creativity “and ABU Prize. She is currently a consultant of Arts of Hong Kong Hang Seng Management College, Mentor of undergraduate students of HKBU and HKAPA . Ms. Ha’s research explores the impact of cultural intermediates in importing Japanese culture to Hong Kong in the 1980’s.